"Mom, can we go to the library today?" This question is invariably answered with, "Let me see how many fines I have first..."
Because, usually, there are a lot of them. Somehow making the trip to the library to return the books I've checked out is just too much energy, so I hang on to them for weeks. All the while, the fines stack up and before I know it, I owe too much money to be allowed to check out any more books! I'm the same way with the things in my head. Situations that went wrong, thoughts that haunt me and swirl up my doubts, words that were said, people I'm worried about, relationships I'm worried about. Sometimes they're so old that I can't even remember the last time I encountered them, but they still stay there, stacked on the shelves of my mind. Sometimes I notice them and I take them out. And I think "Man, I should really get rid of these." But I don't. I keep them and I let them continue to swirl. I let them continue to lie to me. I let them continue to take my focus away from where it should be. But I guess you get to that point where you want to fill your mind and your life with new things. But you're full. So, you have to get rid of the things that you don't need anymore. You have to get rid of the thoughts that you have read and read and read. You have to let go some of the "what ifs." You have to return the things that keep you locked up. Maybe today is that day for you. And I hope it is. Today's a day to embrace new things. To clean out some space, to let some things go. Today is a day to fill your mind with hope and promise, not to harp on what's passed. 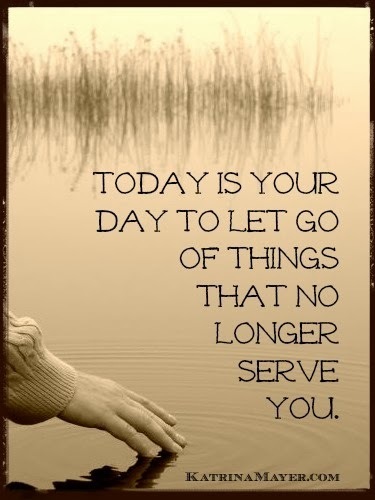 Today is our day to let go. Today is our day to feel the weight lift.